David Hinde completed his B.Sc. at the University of Manchester, then commencing a PhD degree in Nuclear Physics at ANU in 1978. He was a School Postdoctoral Fellow from 1982 to 1984, when he was awarded a Queen Elizabeth II Fellowship. In 1986 he moved to RCNP, Osaka University, Japan and in 1987 to the Hahn-Meitner Institute, Berlin, Germany. He returned to the Department of Nuclear Physics in 1989. He was awarded the Pawsey Medal by the Australian Academy of Science in 1992. He is currently Head of the Department of Nuclear Physics at the ANU. Professor Hinde is a Fellow of the Australian Institute of Physics and a Fellow of Institute of Physics, UK. 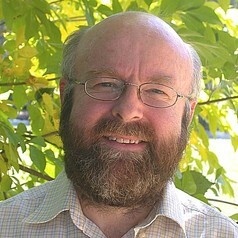 He was elected a Fellow of the Australian Academy of Science in 2006. His research specialty has been developing novel experimental equipment and techniques allowing elucidation of the time-scales associated with heavy ion reactions, to understand the dynamical processes as two individual quantum systems start to overlap. His work has led to a significant change in our knowledge of nuclear dynamics, resulting in a re-direction of international research.